Try before you buy! Order a free sample of this product. Free samples are subject to current availability and usually dispatched within 48 hours by Royal Mail. When we are talking about solid oak flooring know that oak family tree includes over 600 subspecies so you'll have plenty of colouring and textures to choose from. Also, it's a 100% natural material and it would fit perfectly in most residential homes. Parquet can also surprise you with its variations as there are much more patterns available that the well-known and elegant herringbone. This type of flooring is usually glued down to remove any chance of movement of any piece. 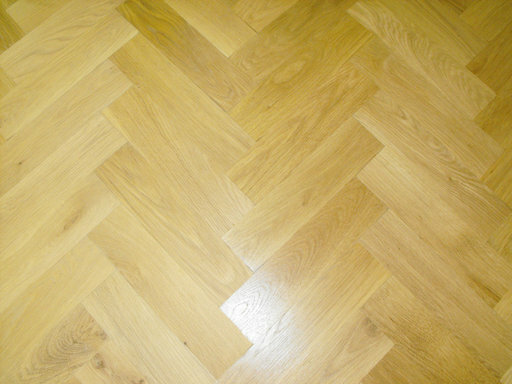 These great solid oak parquet blocks are in natural grade which means there will be close to none of colour variations and there will be some presences of surface defects like knots. The measurements are 20 mm thickness, 70 mm width and 350 mm length. Layers for your for only £00.00 excl. Vat, based on the Size of room specified above. Price is excluding of Flooring accessories and other services. Unfinished products will require additional sealing & finishing service, not included in this quote. Our Final installation Quotations come with Materials & Labour Service Guarantee and are subject to an Obligation free site visit (currently London areas only). Smaller sized areas (below 15 sqm) will be subject to a minimum charge. For additional help Call our Service Department on 020 88309782.